Yesterday I wrote about seeing a doppelganger. 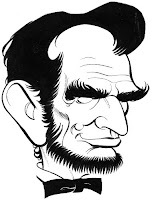 I've also written several posts previously about Abraham Lincoln. 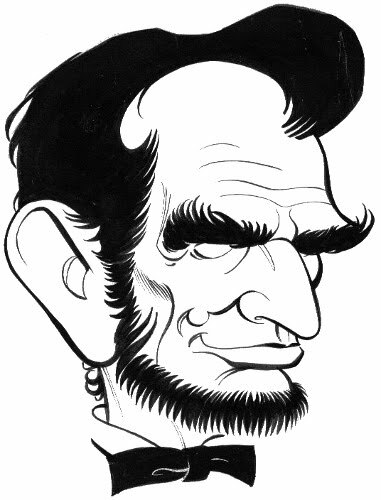 Today I'm following both of these themes with the story of how Abraham Lincoln saw a doppelganger of himself. I came across this on Wikipedia and it is a quote from the book Washington in Lincoln's Time by Noah Brooks*. Noah Brooks claims that he heard this directly from Lincoln in 1864. The following is the quote from Brooks which is supposedly in Abraham Lincoln's own words. "It was just after my election in 1860, when the news had been coming in thick and fast all day and there had been a great "hurrah, boys," so that I was well tired out, and went home to rest, throwing myself down on a lounge in my chamber. Opposite where I lay was a bureau with a swinging glass upon it (and here he got up and placed furniture to illustrate the position), and looking in that glass I saw myself reflected nearly at full length; but my face, I noticed had two separate and distinct images, the tip of the nose of one being about three inches from the tip of the other. I was a little bothered, perhaps startled, and got up and looked in the glass, but the illusion vanished. On lying down again, I saw it a second time, plainer, if possible, than before; and then I noticed that one of the faces was a little paler — say five shades — than the other. I got up, and the thing melted away, and I went off, and in the excitement of the hour forgot all about it — nearly, but not quite, for the thing would once in a while come up, and give me a little pang as if something uncomfortable had happened. When I went home again that night I told my wife about it, and a few days afterward I made the experiment again, when (with a laugh), sure enough, the thing came back again; but I never succeeded in bringing the ghost back after that, though I once tried very industriously to show it to my wife, who was somewhat worried about it. She thought it was a 'sign' that I was to be elected to a second term of office, and that the paleness of one of the faces was an omen that I should not see life through the last term. *Noah Brooks was a California journalist who arrived in Washington in 1862. He first met Lincoln in Illinois five years earlier, and they apparently renewed their friendship during the war years. Brooks, who claimed a close intimate relationship with Lincoln, first published these recollections of Lincoln in 1895. Have always loved this story, too. It's a bit of an oldie but I seem to be forming an attachment with Abraham Lincoln!